It was a tough crowd: the Sustainability and Transportation Committee, including chair Mike O’Brien and vice chair Rob Johnson, both with deep connections into the city’s bike enthusiast community. SDOT came in humble, admitting that they missed their 2016 goals by a significant margin. In fairness, the weather was a big factor: our severe, wet winter, following on the heels of a series of warm, dry ones, impeded a lot of progress. Painting requires 24 hours of dry weather where the temperature is above 50 degrees. In the warm winters, they worked until October then started up again in February. This past winter, they stopped in September and are just now starting up. 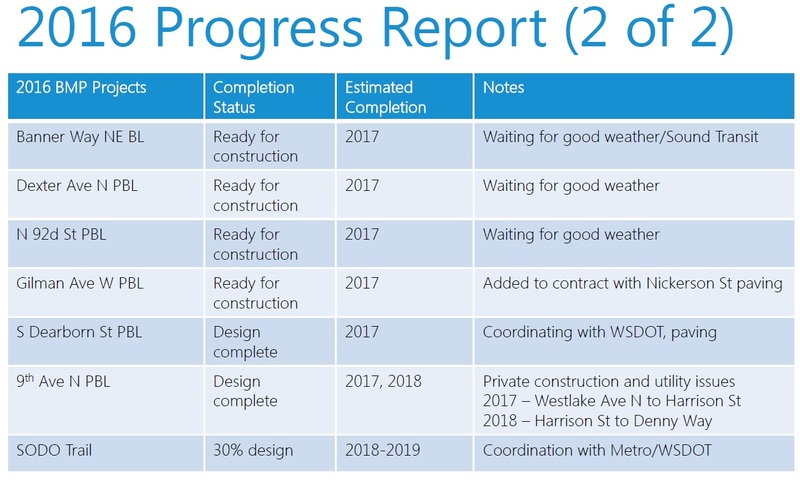 SDOT also ran into trouble coordinating with WSDOT, Sound Transit, One Center City, and private construction projects. They missed on the greenway and bike lane commitments funded by the Move Seattle levy as well. Provide transparency in the process. 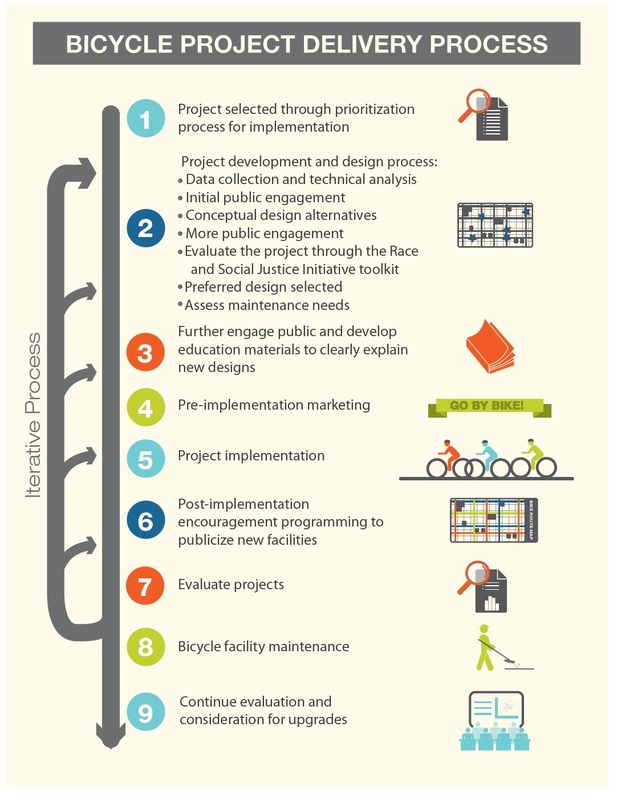 They have engaged with the Bicycle Advisory Board on all decisions for the final prioritized project list. 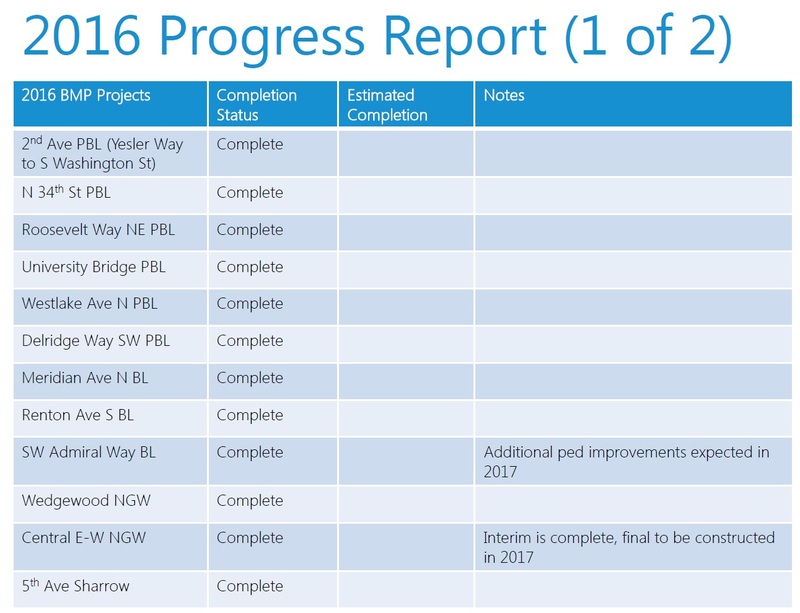 SDOT now builds a detailed spreadsheet of all projects, including the reasoning behind every decision. Improve connectivity and extend the network. This year they selected projects based on how well they connected to the existing network, instead of building disconnected pieces. Coordinate with the One Center City effort (more on that below). Increase quick wins, when urgent needs can be addressed quickly and cheaply (even if temporary), and SDOT crews can deliver things that leverage other street work underway. The One Center City effort, involving multiple partners, is an enormous undertaking to align pedestrian, bicycle, street, transit, and development projects. Earlier this year the partnership issued a draft plan for the “near term path forward,” providing important guidance on what projects can be done now. 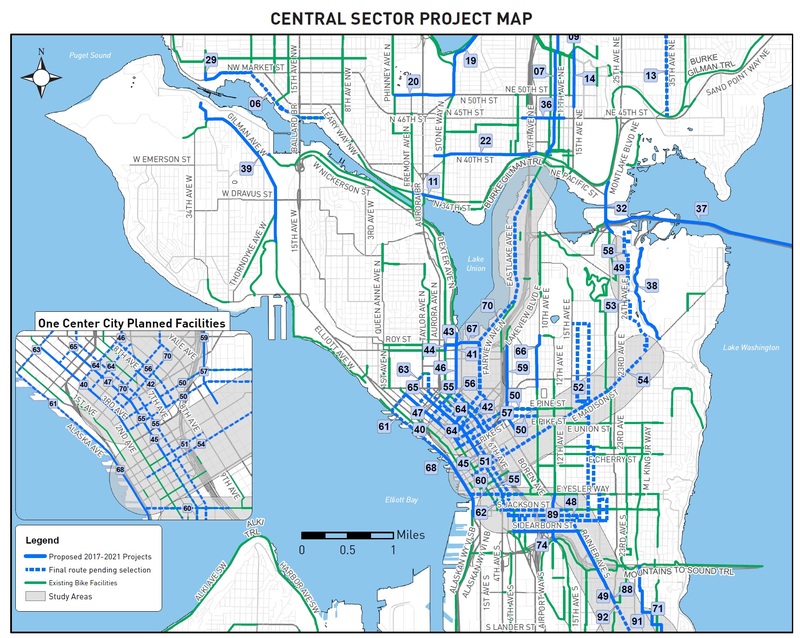 That plan is expected to be finished in May, and that will enable SDOT to move forward on more downtown pieces of the bicycle path network. 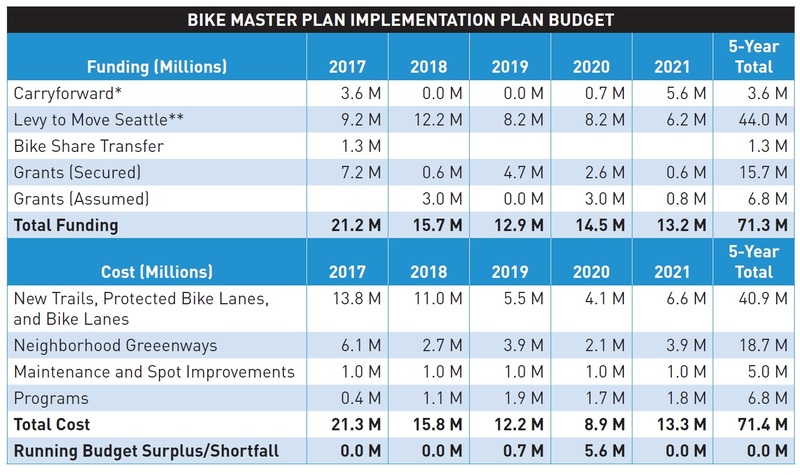 Based on their new approach, SDOT expects to catch up on the goals for miles of bike paths by the end of next year. They are also increasing the number of projects they have “ready to go” so that when one project is delayed they can fill that time with another instead of having idle crews. The department has a draft of the 2017 implementation plan. The Bicycle Advisory Board is giving it a final review, and SDOT hopes to publish the final version in the coming weeks. The updated plan divides the city into three sectors: North, Central, and South. Each map is accompanied by a detailed list of projects planned for the next five years. Since this is Seattle, everything requires extensive community engagement at every stage. Not surprisingly, in the Council meeting both O’Brien and Johnson emphasized how much the community appreciates “quick wins” that SDOT achieves to improve the bike network in the short term. 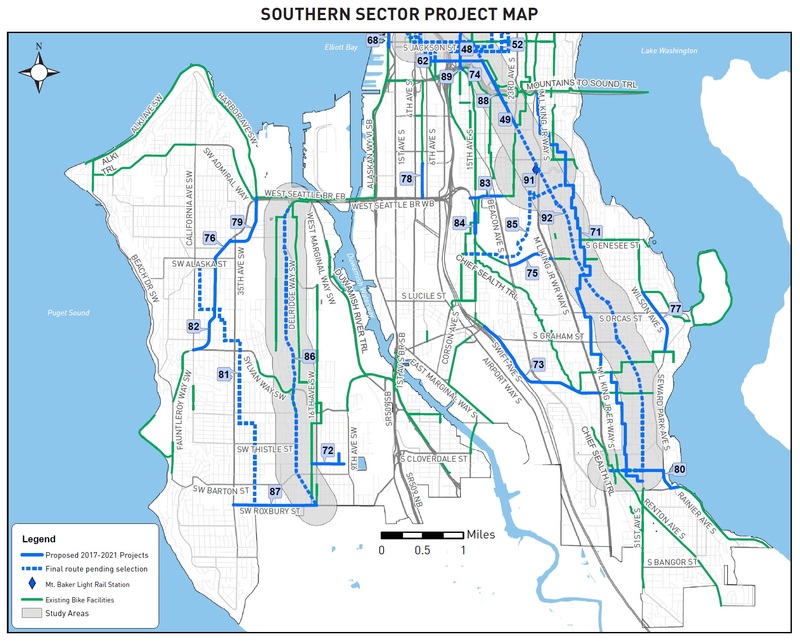 Johnson also told SDOT that he wanted to see the department coordinate more with WSDOT on the 520 project, and with Sound Transit on access points to light rail stations. Officially, the update to the implementation plan is late; it was due on March 31. O’Brien expressed a bit of frustration both that it was late and that SDOT didn’t make that known until a few days before the due date, but he also recognized that the Council (which imposed the requirement for annual updates as well as the deadline) is asking for something big and complicated with many stakeholders, and was open to the idea that they were asking too much of SDOT to push through annual updates on a fixed schedule. To their credit, SDOT begged off that, and simply responded that they need to start working on it earlier. 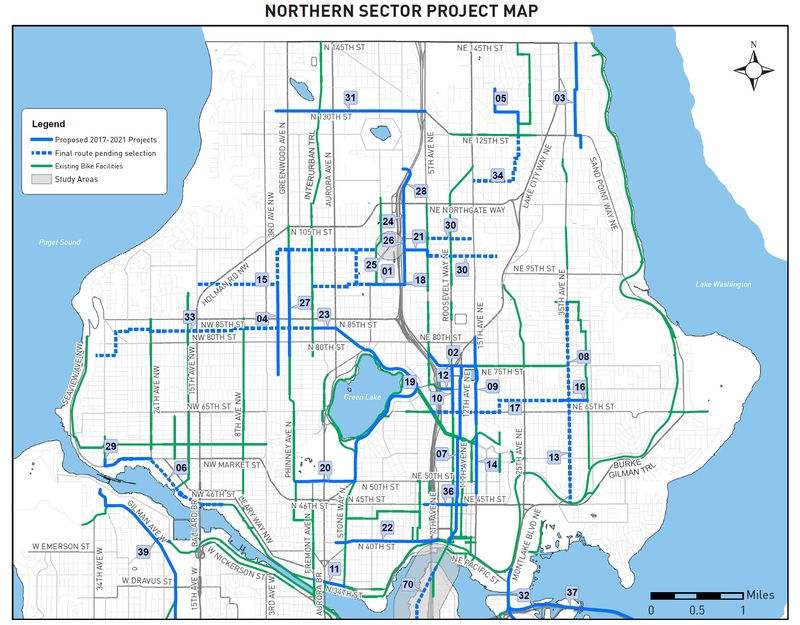 Expect SDOT to bring the final version of the plan back to the Council in the coming weeks.